Though shot like a low-budget documentary, there’s a certain authenticity and realness to Seis Pistos’ “Living On A Song” video. At its core, the video chronicles the everyday life of a rebellious girl who rolls out of bed late, walks through a poor neighborhood and dances by herself before joining her friends who are just as equally looking for trouble. The whole scenario fares quite well with the song, which is played by Seis Pistos in the middle of a skate park while lead vocalist Ivan Chavero saunters around freely and screams at the camera his reasons for questioning the greater system. Amidst the madness, there are random clips of telemarketers at work, preppy men dancing choreography entirely in black and white, and even a gorilla reading. Sure, the connection among it all doesn’t make much sense, but the boys of Seis Pistos simply don’t care, declaring that they “don’t want to be another slave of modern days” and just want to break away from what’s expected of them. Complaining about the mundane life of working from 9 to 5 is nothing new, really, but Seis Pistos takes their outrage to another level. 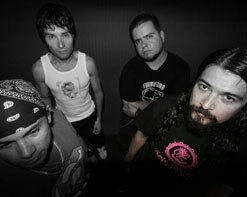 Best described as a Latin punk band mixed with a little bit of ska, Seis Pistos wears their influences on their sleeves. It’s quite obvious that Seis Pistos respects those who came before them – whether it’s Rancid or NOFX – and will gladly accept comparisons to their American counterparts. “Living On A Song” is just a taste of what Seis Pistos is all about. You can find the song off of their album Crisis, which was released by Peach Records last year. The album contains exclusively English tracks unlike their previous albums that were sung in Spanish. Seis Pistos is a great representation of the punk movement in Mexico, and the video for “Living On A Song” without a doubt reflects that. We’re definitely excited to be working with this international punk powerhouse and can’t wait to hear what you think of Seis Pistos. If you need more info, call Andy Gesner at 732-613-1779 or e-mail us at HIPVideo@aol.com. You can also visit www.SeisPistos.com.mx to get more info on Seis Pistos.